Joy and Mark Schilling are Stitches of Joy Quilting. After full careers in public service, Joy and Mark embarked on a journey of opening a business in an industry where the people are happy and love what they do. Joy has been a lifelong sewer and piecing quilts for over 25 years. Her grandmother taught her how to embroider at the age of 4 and made gifts of handmade quilts to all her children and grandchildren. Her mother taught her clothes making at the age of 10 and she designed and sewed most of her clothes from her teens through our early years of marriage. She began piecing quilts and quilting with her domestic machine in her early 20’s and has continued for years. Mark is an engineer by training and has admired the intricacy of quilts for years (and Joy’s “fabric stash”). 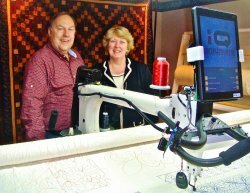 He began his piecing and longarm quilting in 2010 and has embraced it as his new vocation. His hobbies throughout our life married his skills in woodworking and car building to finished rooms in our homes and cars our boys drove. We both love to create things with our hands and hearts. We both participate in several continuing education quilting conventions each year to continually improve our skills by learning new techniques, viewing latest tools, materials and processes and incorporating them into partnership, Stitches of Joy Quilting. Your quilts will ultimately benefit from our level of interest to always improve. Opening this long arm business has truly been a dream fulfilled for us and we look forward to sharing our passion for this industry with you.